In this blog post we will go into further details of one of the most common state changes in scene rendering: binding shader resources such as uniform- or storage-buffers, images or samplers. To avoid performance pitfalls of traditional individual bindings Vulkan organizes bindings in groups, which are called DescriptorSets. Each group can itself provide multiple bindings and there can be multiple such groups in parallel using a different set number. The number of available sets is hardware-dependent, however there is a required minimum. DescriptorSetLayout: This object describes which bindings are in the DescriptorSet for every shader stage. For example, we define at binding 0 a constant buffer used by both vertex and fragment stages, at binding 1 a storage buffer and at 2 an image only for fragment stage. It is the developer’s responsibility to ensure the shaders (SPIR-V) have compatible definitions for the DescriptorSet. 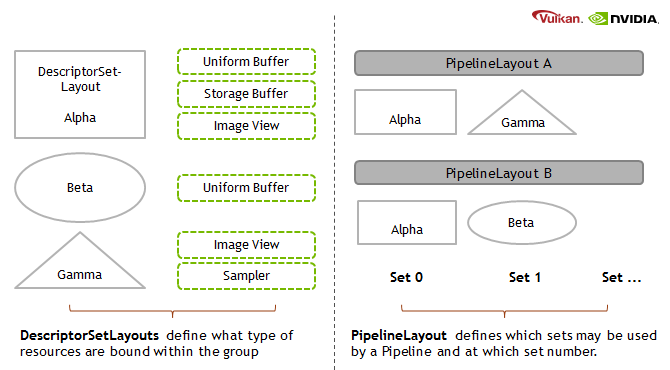 PipelineLayout: As a pipeline (shader and most important rendering state) can have multiple DescriptorSets, this object defines which DescriptorSetLayouts are used with each set binding number. Using the same DescriptorSetLayouts at the same units across pipelines, has some performance benefits, more about that later. DescriptorSet: This is the object that we will later use to bind the resources, therefore it will contain the actual data we reference. Image, Sampler or Buffers are referenced. DescriptorPool: The DescriptorSets are allocated from the pool. Which layouts and how many sets for each can be allocated is defined by the developer at creation time of the pool. What are the motivation behind this design? At this point it is important to stress that Vulkan was designed by many companies within the Khronos group, at least a dozen were making major contributions and more than twice that were seriously involved. Software developers were looking for a design that helps them in usage scenarios where they were typically bottle-necked in the past, and hardware vendors want interfaces giving enough flexibility within their implementations. One scenario software developers often found that within the hot loop of rendering scenes, is that they had bindings that happen at different frequencies. By making proper use of the parallel DescriptorSet bindings and PipelineLayouts the software developers can now represent this in Vulkan (increasing set number as we descend). In principle you can do this in previous APIs as well, however, Vulkan tells the driver up front that in this example the “view” bindings, would be common to all shaders at the same binding slot. A traditional API would have to inspect all the software bindings when the shaders are changed with less apriori knowledge about which are being overwritten and which are important to keep. The above illustration shows that bound DescriptorSets stay active as long as the PipelineLayout for that binding slot is matching. We recommend making use of the different set numbers, to avoid redundant bindings. Putting many bindings that have very different frequencies in the same DescriptorSet can be bad for overall performance. Imagine a DescriptorSet with several textures and uniform buffer binding of which only one changes, that’s potentially a lot of data being sent to the GPU that effectively doesn’t do anything. Another scenario that software developers faced is changing just some shader data on the same “loop” level. Material and object data such as matrices can be very frequent in large scenes (CAD applications…). Uniform Buffer Binding: As part of a DescriptorSet this would be the equivalent of an arbitrary glBindBufferRange(GL_UNIFORM_BUFFER, dset.binding, dset.bufferOffset, dset.bufferSize) in OpenGL. All information for the actual binding by the CommandBuffer is stored within the DescriptorSet itself. Uniform Buffer Dynamic Binding: Similar as above, but with the ability to provide the bufferOffset later when recording the CommandBuffer, a bit like this pseudo code: CommandBuffer->BindDescriptorSet(setNumber, descriptorSet, &offset). It is very practical to use when sub-allocating uniform buffers from a larger buffer allocation. PushConstants can be practical for very a small amount of information passed to drawcalls. Too much information would slow down CPU side due to additional allocations for the values being done. Be aware that the GPU side updates may affect very low complexity draw-calls, too. Dynamic offsets are very fast for NVIDIA hardware. Re-using the same DescriptorSet with just different offsets is rather CPU-cache friendly as well compared to using and managing many DescriptorSets. NVIDIA’s OpenGL driver actually also optimizes uniform buffer binds where just the range changes for a binding unit. As you can see Vulkan being an “explicit” API provides various means to let developers express their intended use in advance.